Percutaneous coronary intervention (PCI) though widely employed in adults, is rare in small children and infants. We report successful left main coronary artery (LMCA) stenting in a 3.6 kilogram, 10-week-old infant with an unusual clinical presentation caused by critical, long-segment LMCA stenosis after arterial switch operation. A 3.25 kg male infant with double outlet right ventricle, ventricular septal defect (VSD) with side-by-side great vessels and D-malposed great vessels (Taussig-Bing), underwent an arterial switch operation (ASO) and VSD closure at 4 days of age. The right coronary artery (RCA) was normal, but the left main coronary artery (LMCA) arose anomalously superior to the commissure between the posterior and left lateral sinuses of valsalva and through the wall of the aorta to the anterior interventricular groove (intramural). Coronaries were implanted using the medially based trapdoor approach. Due to a kink in the reimplanted LMCA, an anterior gusset in the pulmonary artery (PA) was placed, allowing the left PA to roll backwards and superiorly away from the coronary. However the kink persisted and a new anastomosis had to be carried, after which the patient was successfully weaned from bypass with normal ventricular function on intraoperative transesophageal echocardiogram. He had a long postoperative course with persistent chylous effusions and was discharged at 5 weeks of age. Two weeks after discharge (7 weeks postoperative), the patient had an episode of crying, followed by coughing, gasping, and struggling for breath. He was apneic for approximately 20 s, became unresponsive. and blood was noted in his mouth when his mother initiated cardiopulmonary resuscitation (CPR). Upon intubation, blood-tinged frothy secretions were noted in the endotracheal tube (ETT) and he required high-pressure ventilator support to maintain adequate oxygen saturation. Upon arrival at the cardiac intensive unit, his initial pH was 6.9. Chest X-ray showed bilateral pulmonary edema. Over the next 48 h he had numerous episodes of hypertension with systolic blood pressures in the 160s, agitation, desaturation, and bradycardia. He frequently appeared mottled and pale and blood was occasionally suctioned from the ETT. The episodes resolved with sedation, paralysis, and increased positive end expiratory pressure (PEEP). During these episodes, his electrocardiogram (EKG) and echocardiogram were normal with a troponin leak up to 1.17 ng/ml. At 10 weeks of age and 3.6kg, the patient was taken to the catheterization laboratory and noted to have severe stenosis of the LMCA [Figure 1] and [Video 1], [Video 2] and [Video 3]. The left ventricular end diastolic pressure (LVEDP) was 14 mmHg at baseline. However, when the depth of the anesthesia was reduced, his systolic blood pressure and LVEDP increased to 120 and 24 mmHg, respectively, suggesting severe left ventricular diastolic dysfunction which was attributed to the compromised LMCA. After consultation with the patient's surgeon and informed consent from the patient's parent, we proceeded to stent the LMCA as a rescue procedure. A three-dimensional (3D) angiogram was performed through a 4F pigtail catheter positioned in the ascending aorta to define the length of the stenosis of the LMCA and its relationship to the aorta [Figure 2]. Thirty milliliter (60% contrast and 40% saline; 5 cc/kg of contrast) was given at 5cc/s times 6 s. Transesophageal pacing at a rate of 240/min was performed to optimize the images. The 3D rotational angiography was used to obtain the best working angle. 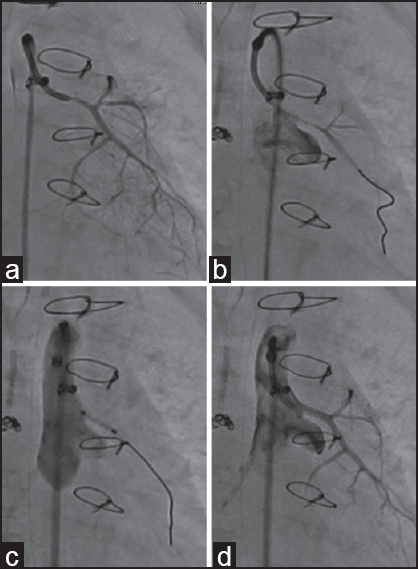 Measurements of the LMCA were performed on 2D angiogram in that angle [Figure 3]. Clopidogrel (2 mg/kg) and heparin were administered. A 4F angled glide (Terumo, Japan) was placed retrograde in the ascending aorta and exchanged over a 0.035wire (Cook Inc, Bloomington, IN) for a4F long sheath (Cook Inc, Bloomington, IN) was used and its tip was positioned near the origin of the LMCA. A 4F JR1 catheter was passed through the long sheath and a 0.014 Balance Middle Weight (BMW) wire (Abbott, IL) was placed distally into the left anterior descending artery [Figure 1]b. After injecting 10 mcg of nitroglycerin (3 mcg/kg) into the LMCA, a 2 × 8 mm Multilink Mini-Vision Coronary Stent (Abbott, IL) was introduced over the wire into position. 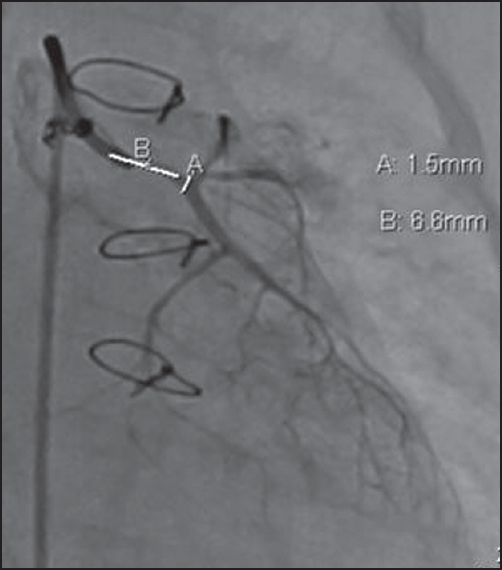 Multiple angiograms were performed to position the stent so as not to cross the bifurcation, and at the same time not protrude too much in the aorta [Figure 1]c. The stent was deployed with inflation to 16 atm [Video 4]. 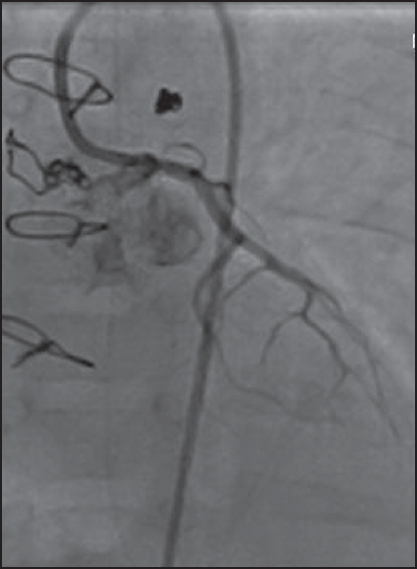 An angiogram was performed that showed a patent stent in good position [Figure 1]d. A week later following a decrease in clopidogrel dose to 0.5 mg/kg/day and having general anesthesia for minor eye surgery; the patient decompensated with acute left ventricular dilation and severe dysfunction. 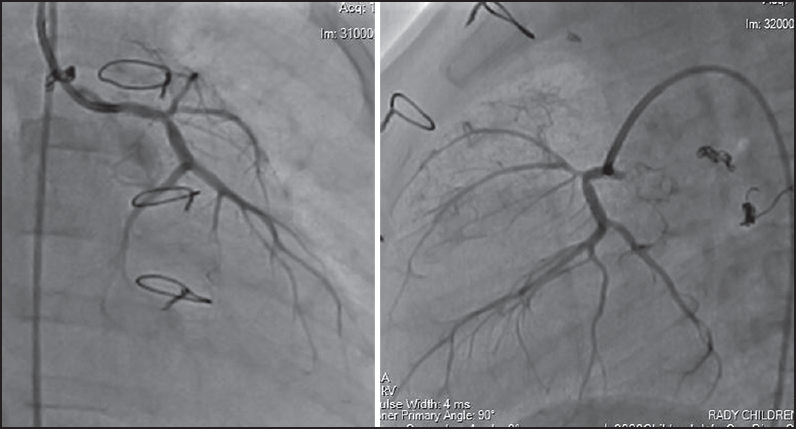 He was taken urgently to the catheterization laboratory and selective left coronary angiography showed partial obstruction of the proximal portion of the LMCA stent (40%), probably due to platelet aggregation [Figure 4]. Balloon angioplasty was performed using a 2 mm × 6 mm Sprinter balloon (Medtronic, MN) followed by intracoronary infusion of nitroglycerin and integrilin. There was marked improvement of ventricular function over a 24 h period and he was discharged home. The patient underwent elective cardiac catheterization 7 months later. The stent appeared patent with mild narrowing at the origin of left anterior descending distal to the stent. This may have been caused by intimal build up or a kink from vessel growth [Figure 5]. A dobutamine stress echo was performed (1 year after stent placement) and did not show regional wall abnormality. He remains asymptomatic, without shortness of breath or agitation and is growing and developing well. Percutaneous coronary artery stent implantation has not been extensively employed in the pediatric population  because of lack of appropriate equipment for such procedures and future growth of the patient and coronary. There are only a few case reports in the literature in infants less than 3 month of age, summarized in [Table 1]. , This case represents an unusual presentation of coronary artery stenosis post ASO. Even though flash pulmonary edema is a well-known manifestation of coronary stenosis in the adult population, it has not been described in the pediatric population. The incidence of coronary stenosis post ASO is about 7%. The lack of available stent sizes for this sized distal vessel and lack of equipment designed for this procedure made it more challenging. The distal vessel measured 1.5 mm and the length to the bifurcation was 6 mm, the smallest available stent is 2 mm × 8 mm. Precise placement so as not to cover the bifurcation and not to protrude too much into the aorta was achieved using 3Drotational angiogram to guide the exact camera angle needed to achieve this task. Seven months later, the stent appeared patent with mild narrowing at the origin of left anterior descending distal to the stent. This may have been caused by intimal build up or a kink from vessel growth. A drug-eluting stent could have been considered; however, the smallest was 2.25 mm and with some studies showing no clinically significant difference in the rates of the death or myocardial infarction between the two stents,  we elected to proceed with the smaller one. Also, the need for longer dual antiplatelet therapy in drug-eluting stents might be problematic. Medium term follow-up for this patient including a normal dobutamine stress echo is promising. Bench testing of the current stent suggests a future expandable diameter up to 6 mm. The stent will continue to be dilated by angioplasty as the child and coronary artery grows. If angioplasty can no longer achieve goal diameter, surgical repair may be necessary. Bratincsak A, Salkini A, El-Said HG, Moore JM. Percutaneous stent implantation into coronary arteries in infants. Catheter Cardiovasc Interv 2012;79:303-11. 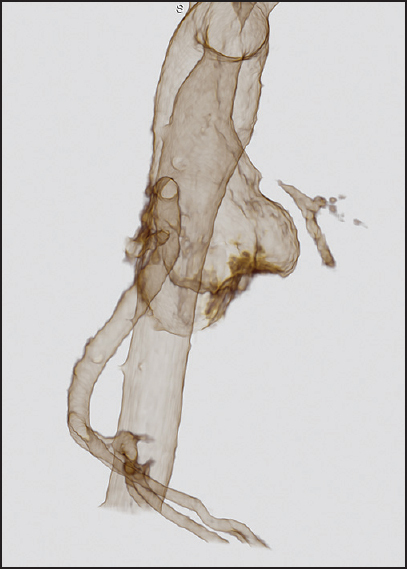 Chrysant GS, Balzer D, Taniuchi M. Left main stem coronary artery stenting in a 3-month-old child after anomalous left coronary artery from pulmonary artery repair. Pediatr Cardiol 2005;26:734-6. Sineelnikov YS, Kornilov IA, Redkin DA, Streinikova MS, Ivantsov SM, Kalinin RA, et al. Left main coronary artery stenting in a neonate after arterial switch operation for transposition of the great arteries. World J Pediatr Congenit Heart Surg 2014;5:105-9. Fyler D. Report of the New England Regional Infant Cardiac Program. Pediatrics 1980;65:377. Stettler C, Wandel S, Allemann S, Kastrati A, Morice MC, Schömig A, et al. Outcomes associated with drug-eluting and bare-metal stents: a collaborative network meta-analysis. Lancet 2007;370:937-48. Danon S, Gray R, Morgan G, Goldstein B, Crystal M, Gordon B. Expansion characteristics of commonly used intravascular stents: How big can you go? Results from an international multicenter PICES investigation. Manuscript in publication.